BBC Philharmonic; Gianandrea Noseda, dir. 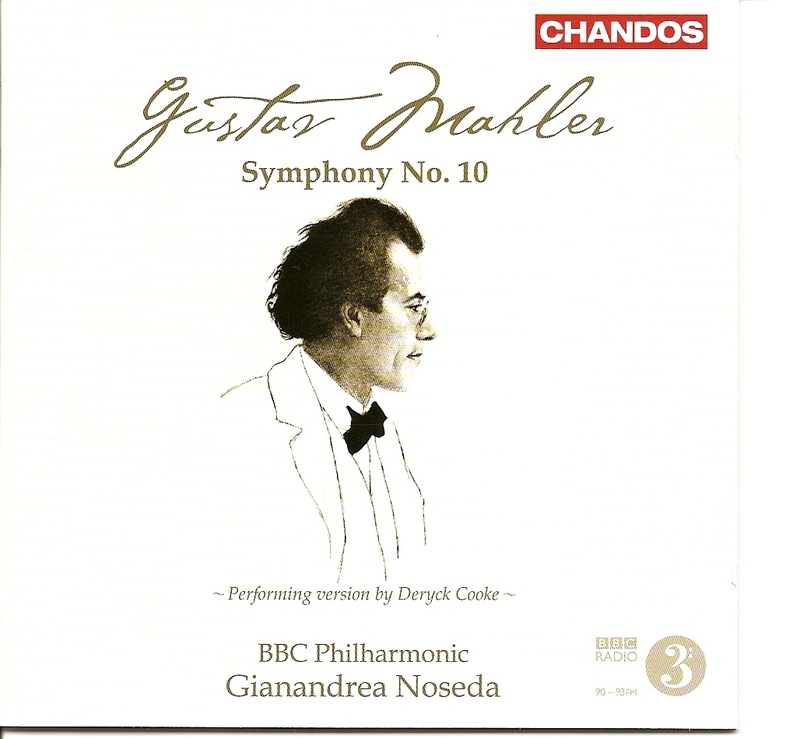 The BBC Philharmonic under Gianandrea Noseda has never committed an indifferent performance to disc for Chandos and the present issue is no exception. Mahler's Tenth in the performing version by Deryck Cooke now occupies a secure space in the symphonic landscape and the addition of this account from Manchester is very welcome. Noseda's objective interpretation is similar to those of Kurt Sanderling (1978 - Berlin Classics) and Micahel Gielen (2005 - Hännsler). His escalation of the tension in the opening Adagio is subtle and this ultimately magnifies the effect of the eruption of dissonance later (17:15) in the movement. The performance features loving tenderness at all of the right moments without descending into maudlin exaggeration. The orchestra plays with wholehearted dedication as Noseda draws out moving string tone and immaculate wind passages. In this demanding field of endeavour, which received the best efforts of Eugene Ormandy, Sir Simon Rattle (twice), Riccardo Chailly and Eliahu Inbal (as well as Sanderling and Gielen), Noseda's performance can be regarded as distinctive and distinguished. The participation of David Matthews in the recording is of great importance. In the authoritative booklet note, Matthews relates how he and his brother Colin became involved in Cooke’s revision of his first amended draft of the score. Youthful enthusiasts, the Matthews boys worked along with Cooke over a period of twelve years until the publication of "the final revision" in 1976. On the Absolute Necessity for Mahler’s Tenth: Michael Steinberg put it this way: "Having a Mahler Tenth adds a great human and musical experience to our lives...Knowing this music also alters our perception of Mahler’s life work." Distinguished Mahlerians who could never accept this included Bruno Walter, Leonard Bernstein, Pierre Boulez and Bernard Haitink. Late in life, Sir Georg Solti was studying all of the available performing versions to devise a conflation or best solution in order to record a hybrid Tenth. In addition to the Cooke version, the work has been undertaken by Joe Wheeler, Clinton Carpenter, Remo Mazzetti Jr. and Rudolf Barshai and all have been recorded. While Cooke has gained the most adherents, each version adds to the sum of our knowledge about the symphony. There has been wide speculation about the prophetic nature of the music of Gustav Mahler, particularly the Sixth Symphony. This is illusory. We merely had to endure two-thirds of the most violent century in history to align human experience with the scope and articulation of Mahler’s musical expression. But just as the Sixth could be construed as heralding the world wars, the Tenth can evoke the range of emotions experienced on and after September 11, 2001. Horror, rage, fear, grief and, ultimately, consolation in immortal love all leap from the pages of the score. There is even a ghostly connection between the music and those terrible events. The muffled drum strokes which close the fourth movement and continue into the fifth were inspired by the funeral procession of a New York City fire captain who had been killed on duty. Mahler observed this ceremony and was deeply moved by it. Symphony No. 9 had an element of what Dylan Thomas related: "Though wise men, at the end, know dark is right." Mahler, with the Tenth completed the stanza: "(They) do not go gentle into that good night." Wait for it...The Last Word is at Hand: The Ides of March will be an auspicious date for English-speaking admirers of the composer this year. On that day, Gustav Mahler: Volume 4: A New Life Cut Short 1907-1911 by Henry-Louis de La Grange will be published. This is not simply a translation from the original French, but a full revision to take in the most recent revelations about the subject and the latest scholarly research into his music. It will certainly offer the most extensive analysis of the Tenth Symphony to date. Hopefully, Oxford University Press will get around to republishing the revised first volume in time for the Mahler centennial in 2011. My acquaintance with the music of Gustav Mahler goes back into my teens when Deryck Cooke's first version of Mahler’s 10th symphony was causing a stir in the San Francisco Bay Area where I grew up. Before that I had never heard of Mahler or his music, nor had I heard of Anton Bruckner either. It is a curious fact that there seems to be those who are partisans of one and despise the other or vice versa. For example, I have a close friend who is as bold and audacious a composer as ever there could possibly be, who writes hour and a half long piano sonatas that are excruciatingly difficult to listen to and impossible to play, etc. and all I did once was mention Mahler and he said, “Oh, I don’t like him,” whereupon I knew better than to continue the subject any further. Of course he just loved Bruckner. Well for me, Bruckner took some getting used to and still does, though he makes much more sense when one realizes that he was an organist and tends to use the orchestra as an extended organ. But then perhaps organ music was never really my first love anyway. I’ll grant that the final three Bruckner symphonies, when well performed, can be interesting works, but they really have only tangential claims to association with the works of Mahler as far as I’m concerned. Mahler it seems to me has far more in common with, believe it or not, Edward Elgar (whom he admired) or Jean Sibelius and later even Dmitri Shostakovich. But after discovering the 10th which I consider a pivotal work in the history of music that looks both back in anguish and forward with transcendence (there is probably nothing quite like the pathos of the final sections in the Finale in all of music), and as it were working backwards through his work, getting to know each symphony and song cycle over time, I have long concluded that Mahler was in his genre, the symphony, one of the supreme geniuses of all time. Of course one can’t usually have a diet of predominantly Mahler for too long. One needs the variety of smaller scales and different intentions. For some years past I had gone through many phases where one composer or another fascinated me and when I only wanted to hear the music of that one particular master exclusively, and each of them represented something different, a different emotional, mental and spiritual need. For example as a pianist, for no really particularly good reason, for the past year or so I haven’t felt like playing anything but Beethoven. It will pass I am sure. Perhaps I’ll devote the same energy again to Mozart, Scriabin, Chopin (whom I find difficult), Schubert (whom I find clumsy) or Debussy. But since the world situation seems to have been going from bad to worse since the end of 2007, increasingly I began to hear in my mind the familiar and compelling freakish refrains and mighty portents of Gustav Mahler. Here’s a novel idea; Mahler was a prophet of doom. I could elaborate on each symphony and show how this idea works out, but let’s take the 6th as the most compact and basic statement in this regard. The first movement is militant and portends a coming headlong military violence that is inextricably bound up with the lust for power of the ruthless and the cruelty that they will use to crush the aspirations of the meek, the poor, the easily wounded in every respect. There are moments of reflection, of asking the deepest questions of why and when will real love and real beauty be restored and the end of this movement seems triumphant as if welcoming the long sought and deeply loved victor back from the war. The second movement looks back on an easier more tender time when things were simple and people were kind. The third movement returns to one of the perennial threads in Mahler’s music, the cynical self importance of the modern world, the would be mighty, heedless of what they have done and will do to destroy not just the past but ultimately themselves too. The finale of course is a series of alternations between the hammer blows of conflict, war, the rising and falling of nations, peoples, empires, and interspersed are periods of glowing peace, which of course is disturbed by the usual elements; the agitation of grumblers, the self importance of political and social forces and leaders symbolized by musical instruments and recurring themes and motifs. What does he see at the end? The destruction of everything. The best performances of Mahler are always those where the intentions are straightforward, where there is little sentimentality added as the music itself has plenty of emotion to carry all by itself. Should people be afraid of Mahler? Probably so, if they are really resonating to his message. It should shake them and fear is also part of the message. He wrote at a time that foretold his own end of course, since he was a very frail man who longed for a strenuous life, and moreover he had one where various kinds of responsibilities were thrust upon him. He was also portending the end of civilization as he knew it and the future he wasn’t so sure was going to be all that great. But in another sense, especially when one considers the whole arc of his work and where he ends up, at the finale of the 10th, Mahler told the truth about life, like it or not; that for most people life is hard and suffering is universal but that the yearning for real love and real empathy was also universal. He wasn’t in the mood to sugar-coat anything and even his sugar coating often has an acrid taste to it like some sugar substitutes of today, on purpose too. He is telling us something we need to hear, like it or not. Mahler was also militant about his feelings and these are expressed perhaps no more vividly than in his masterful symphonies. Since the Mahler bug has of late bitten me rather hard, it is of tremendous interest to me to find anyone at all who has had the same or nearly the same experience with this composer. You are free to contact me on this subject at any time, and thanks to any and all for getting more Mahler performed, heard and thought about.